Awarded 1995 NALED 1st Runner-up Graphic/Lithograph of the Year! Every Year 30,000 Art gallery dealers, art critics, art reviewers in major publications vote for "Best Painting" It is called the National Association of Limited Edition Lithographs Award ("NAILED" Award). This prestigious art award gives recognition to the artist and his art which is equivalent to winning "Best Picture" at the academy awards and propels the artwork into sell out status. 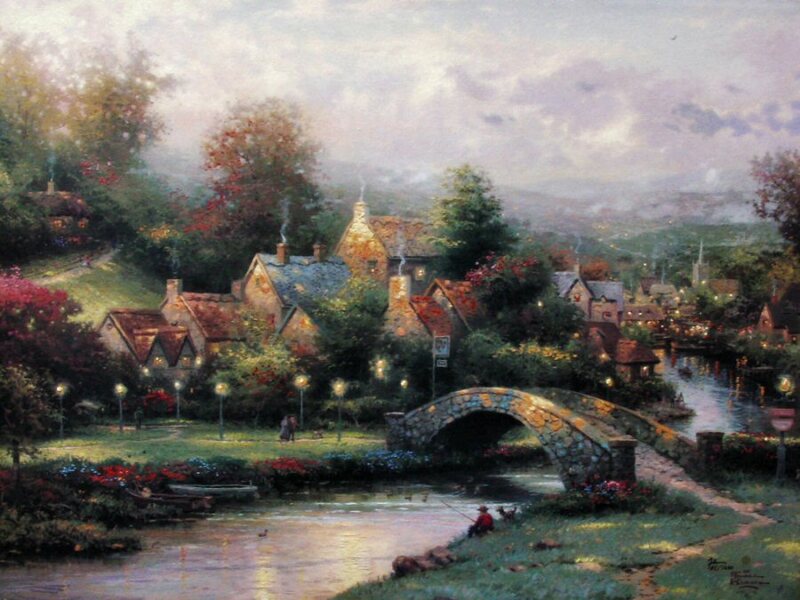 Lamplight Village is the fourth painting in Thomas Kinkade's popular Lamplight Lane series. The other paintings the collection are Lamplight Lane, Lamplight Brooke, Lamplight Inn, Lamplight Bridge, Lamplight Manor and Sunset on Lamplight Lane. ++++ Brass Plaque with the legend "Lamplight Village ~~ Thomas Kinkade"
++++ Theme: British village, (South of England) bridge over stream Gallery Proof Edition (G/P) Gallery Proofs are issued in quantities significantly smaller than S/N. 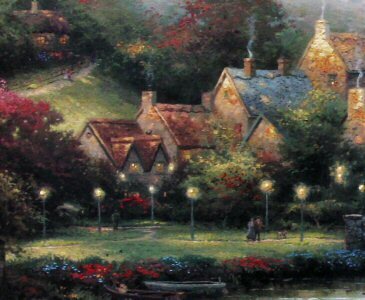 Before May 1997 the Signed & Numbered and A/P,G/P and P/P were ALL personally hand signed on the front of the canvas by Thomas Kinkade. Can you find it? HIDE and SEEK. FIND IT IF YOU CAN! 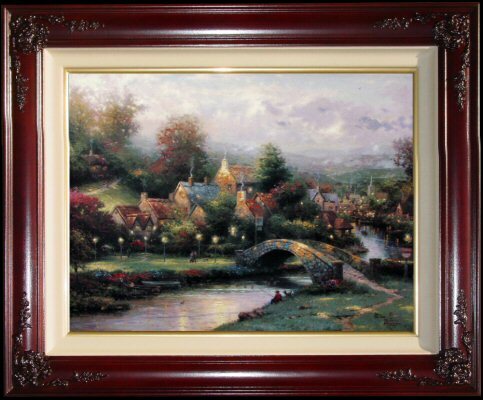 "In this painting I wanted to create a scene with a great sense of discovery to it - as though you could stroll over that stone bridge and wander around the village finding things of interest everywhere you looked. 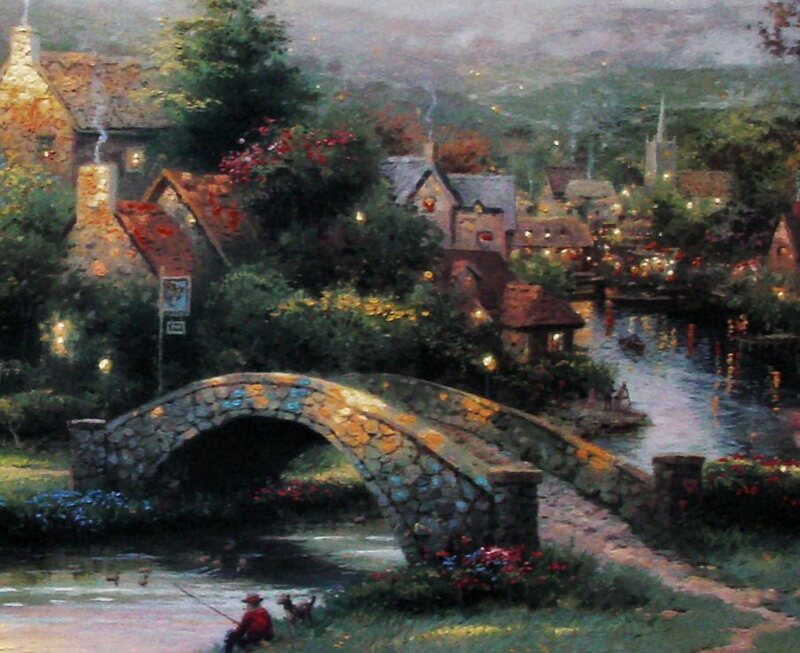 An artist with an easel, twelve ducks, three cats, a mouse (a la David Winter), a workman on a roof, seven hidden 'N's', Kinkade's daughter Chandler (with a 'C' on her clothing), Kinkade's daughter Merritt (with an 'M' on her clothing), four dogs, nine lamp posts, two hearts with initials, two hearts with no initials, ten smoking chimneys, a person in a boat, four birds in trees, one perfect rose, a painter's palette, a man with a pipe (perhaps Norman Rockwell), and an owl."